A Course in Real Analysis provides a rigorous treatment of the foundations of differential and integral calculus at the advanced undergraduate level. 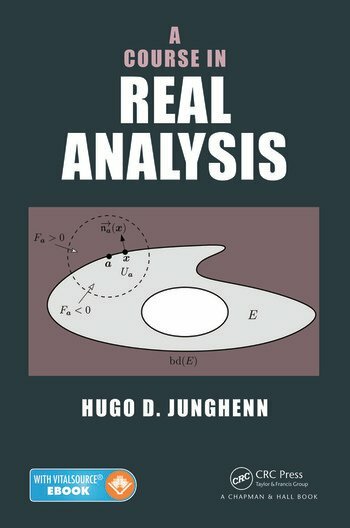 The book’s material has been extensively classroom tested in the author’s two-semester undergraduate course on real analysis at The George Washington University. The first part of the text presents the calculus of functions of one variable. This part covers traditional topics, such as sequences, continuity, differentiability, Riemann integrability, numerical series, and the convergence of sequences and series of functions. It also includes optional sections on Stirling’s formula, functions of bounded variation, Riemann–Stieltjes integration, and other topics. The second part focuses on functions of several variables. It introduces the topological ideas (such as compact and connected sets) needed to describe analytical properties of multivariable functions. This part also discusses differentiability and integrability of multivariable functions and develops the theory of differential forms on surfaces in Rn. The third part consists of appendices on set theory and linear algebra as well as solutions to some of the exercises. A full solutions manual offers complete solutions to all exercises for qualifying instructors. With clear proofs, detailed examples, and numerous exercises, this textbook gives a thorough treatment of the subject. It progresses from single variable to multivariable functions, providing a logical development of material that will prepare students for more advanced analysis-based courses. Hugo D. Junghenn is a professor of mathematics at The George Washington University. He has published numerous journal articles and is the author of several books, including Option Valuation: A First Course in Financial Mathematics. His research interests include functional analysis, semigroups, and probability. "… intended for a first course in real analysis. … It could also be used to support an advanced calculus course. … The approach is theoretical and the writing rigorously mathematical. There are numerous exercises. … If a library needs to add to its collection in this area, this book would be a good choice. Summing up: Recommended. Upper-division undergraduates and graduate students." "The book is carefully written, with rigorous proofs and a sufficient number of solved and unsolved problems. It is suitable for most university courses in mathematical analysis."